We’re dedicated to delivering happiness to the people and children of Belarus, but we couldn’t do anything without our amazing team. We have groups of supporters and individuals who regularly supply super knitted clothes and bedding and major companies such as Ikea, Proctor and Gamble and APC Clothing of Tadcaster who generously donate their surplus goods. Our dedicated people come from all walks of life, give up their time freely and spend lots of it lugging boxes about! We’ve been taking convoys to Belarus for over 15 years, four times a year, and we’ve done it with the very best people. We make a huge difference to the lives of adults, children and families still suffering in Belarus. We can equip schools, organisations, communities and homes to make real changes. But we need your help. For over 15 years, our aid team worked with the Chernobyl Children’s Project UK (CCP), delivering a wide range of aid to support sick and disabled children and adults in Belarus. In summer 2013, CCP decided to channel their resources into projects in Belarus, like building homes for disabled children, supporting hospices, setting up fostering programmes and launching training initiatives for companies that cater for the sick and disadvantaged. With few resources left to continue aid deliveries, our team decided to raise funds through sponsorship and events and embark on a final CCP convoy in April 2014. We took six vehicles and a team of 12 to the city of Gomel for one last aid delivery on behalf of CCP. Two months later, 21 members of the aid team met up to discuss what to do next. Would we disband, or could we form our own independent charity? June 2014 Trustees, Chair, Treasurer and wider committee formed. Constitution agreed and signed. June 2014 to date During this period the work of aid collection and fund raising continued unabated towards our planned large convoy for April 2015. July 4th 2014 Initial registration application forwarded to the Charity Commission. November 10th 2014 Registration confirmed: We are Chernobyl Aid UK reg. No. 1159179. From our first meeting back in June 2014 throughout the planning period and beyond, we’re always collecting aid and raising funds for our next trip. 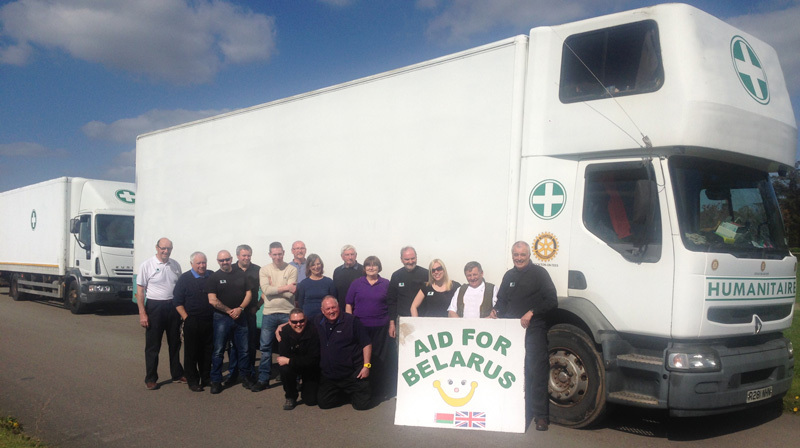 Our next large convoy is planned for April 2015, when we hope to take four vehicles and plenty of aid out to the people of Belarus.